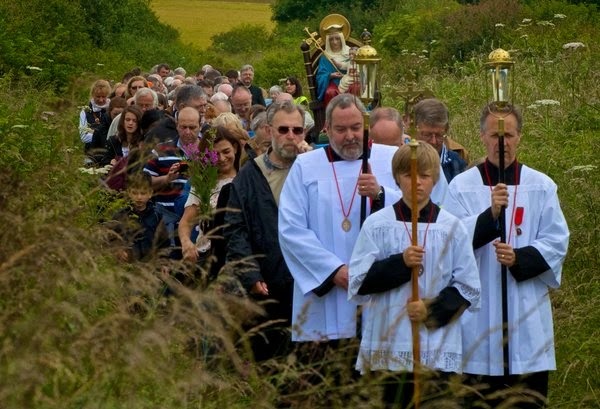 More than four hundred people - the vast majority of them members of the Ordinariate - joined the Personal Ordinariate of Our Lady of Walsingham's fourth annual pilgrimage to Walsingham on Saturday 28 June. The pilgrims also included a group from the Melkite Catholic Church - one of the eastern churches which is in full communion with the Holy See. The pilgrimage was led by the Ordinary, Monsignor Keith Newton. Mgr John Broadhurst, Assistant to the Ordinary, preached. The pilgrimage began this year at the Anglican shrine and progressed to the Catholic one. The rosary was led by the Ordinariate Sisters of Our Lady of Reconciliation, Sister Jane Louise and Sister Wendy Renate, who are based in Walsingham. Afterwards, the administrator of the Anglican Shrine, Bishop Lindsay Urwin, introduced and led the Sprinkling ceremony. The pilgrims then walked in a silent procession to the Catholic shrine where Mgr Newton presided at Mass in the afternoon, which was concelebrated by more than twenty Ordinariate clergy. This year, for the first time at the pilgrimage, the Mass was celebrated according to the Ordinariate Use, which integrates centuries' old Anglican prayers into the Roman rite. Mgr Broadhurst's sermon focused on Our Lord's words in Luke's Gospel,"How is it that you sought me? Did you not know that I must be in my Father's house"? Mgr Broadhurst said that Christianity, like Judaism before it, was a religion of place and he spoke of the great importance of Walsingham, "England's Nazareth" , as a place of pilgrimage since the Middle Ages. He related how Sister Wendy had pleased some parishioners of his recently when she greeted them on their arrival at the Catholic shrine at Walsingham with the words "welcome home". Mgr Broadhurst said that this was what Walsingham was about: "being welcomed and included in the mystery of God's family". He went on: "the Ordinariate has something important to contribute by way of welcoming people into the Catholic Church" and he mentioned two forthcoming Ordinariate events - the Festival at Westminster Cathedral on 20 September and the Called To Be One exploration day on 6 September, which is aimed especially at non-Catholics who might wish to know more about the Ordinariate. Mgr Broadhurst said that anyone who wanted to "come and have a look at what we are and what we are about" was warmly invited to attend one of the events that would be held around the country on the exploration day. Mgr Broadhurst concluded his sermon with a reminder of the Gospel text. "Jesus said: "did you not know that I must be in my Father's house?" Mgr Broadhurst said. " It is very clear to me that the Catholic Church is where I must be. It is the place where our salvation is guaranteed and our faith is secure. What we need to do is to welcome others in and offer to share with them that truth". In a brief address to the congregation after the Mass, the Ordinary welcomed the group of Melkite Catholics, who, he said were a little known example of the wonderful and rich diversity of the Catholic church. Mgr Newton also spoke of the Ordinariate Use liturgy, which he said, took a little getting used to because different forms of worship had to be "given time to sink into your pores". But he said the more he celebrated it, the more he had come to love the Ordinariate Use. It was announced that next year's pilgrimage would take place on 27 June.